http://www.businesslink.gov.uk hired me to manage the design, development and delivery of their new online learning services for start-up businesses, which went live at the end of 2011. I wrote this case study about the project for E-learning Age magazine. Starting a business can be one of life’s most exciting, liberating and rewarding experiences. But working for yourself can also be nerve-wracking, as you need to learn quickly how to promote your business, manage your finances, keep customers happy and meet your tax obligations. My New Business provides start-ups with the core educational support they’ll need to succeed in the first 18 months of trading. With over 200 specially commissioned videos and e-learning courses on a wide range of start-up topics (including business planning, finance, marketing and tax), My New Business is one of the biggest government-backed online learning initiatives of the last 10 years. In this article I’ll outline the high-level project objectives and describe how the videos and e-learning were designed to meet the needs of the target audience. Data analysis. We identified the most popular start-up topics on the site by analysing existing http://www.businesslink.gov.uk usage data, including page views, search terms, common queries to the helpline and suggestions for improvements. User testing. We conducted four rounds of user testing at key stages of project development to gain feedback on e-learning and video prototypes and refined the content in light of customer requirements. A focus group (with a representative mix of Business Link users, including trades people, shop owners, hairdressers, child minders and freelance professionals) was used to select video presenters and narrators to ensure the ‘faces and voices’ of My New Business are appealing and engaging. Content workshops. We facilitated content workshops with key stakeholders from the Department for Business Innovation & Skills (BIS) and Her Majesty’s Revenue & Customs (HMRC). At these sessions, sample user personas were used to prioritise learning content and keep government stakeholders focused on customer needs. After reviewing the data, user feedback and workshop materials, Epic and Thomson Reuters produced a detailed consultancy report which scoped the overall learning requirements and made recommendations for change. The report also provided a comprehensive description of the project lifecycle, including programme governance, project structure for each content area, standardised development/approval processes across all content areas, and change control procedures. Subject Matter Experts (SMEs) are the most important people in any online learning project team. There’s no point creating a course with the production values of a Hollywood blockbuster if the core content isn’t focussed on delivering learning objectives, crammed full of valuable information and factually accurate. As SMEs can make or break an online learning project, it’s vital to select the right people and manage them carefully. Business Link’s Web Content Managers worked closely with over 90 business and tax experts from across the UK to gather relevant source materials and provide Epic and Thomson Reuters with detailed feedback on video and e-learning scripts and prototypes. In order to share work-in-progress e-learning materials with our geographically dispersed SMEs quickly, we used a cloud-based file sharing service, Huddle, to host videos and e-learning prior to site launch. http://www.businesslink.gov.uk has long been recognised as a comprehensive and trusted knowledge base for all things business-related and has a large and loyal audience in the UK and abroad. However, during our initial customer engagement sessions, we found that many users felt that the site was too ‘text-heavy’ and key start-up information was difficult to find. We took this feedback onboard and made the decision to present start-up information in a variety of formats, including a range of video and e-learning object types, as well as plain text, in order to broaden the appeal of the website. All start-up content on Business Link is now accessible fast, via three main access points – the Starting Up Theme page, the personalised ‘Recommended Start-up Tasks’ tool, and the Learning Directory. A robust technical infrastructure is critical to the delivery of high volumes of media-rich learning content over the Internet. All videos on the My New Business are distributed through Brightcove, the world’s leading cloud-based video platform. Brightcove smart players automatically detect the user’s device and bandwidth, and then output video in the most appropriate file size and format. This means that videos on the My New Business site are truly cross-platform compatible and can be played on PC, Mac, iPad, iPhone and Android mobile devices by users with both high and low bandwidth connections. All Flash-based e-learning objects on the site are launched and tracked through the Xtensis SCORM content management system, which has previously been used by the National Learning Network (NLN) to successfully deliver one of the most substantial and wide-ranging collections of e-learning materials in the UK to over 10,000 registered users in the higher education sector. Both Brightcove and Xtensis provide powerful reporting tools which will allow Business Link to closely monitor video and e-learning usage on a daily basis. So how will the overall impact of My New Business be measured? Ultimately the site will be judged on its ability to provide effective and practical educational support to new businesses which helps them to succeed. While it’s far too early to draw any firm conclusions, the initial usage reports from Brightcove and Xtensis are encouraging and show a strong uptake of e-learning and video materials by Business Link customers, with content on generating business ideas, choosing the right legal structure and business planning proving to be especially popular. Feedback via Business Link’s social media channels in the first few weeks since launch has also been very positive, with users praising the engaging and easy to use nature of the new content. Business Link will conduct a detailed user engagement survey in 2012 which will capture customers’ reactions to the My New Business site, including questions on how the new learning content has helped change behaviours, in terms of fostering good business and compliance habits. Syndication of content through partner sites will extend the reach of the materials and provide additional sources of feedback. HMRC is also intending to commission an independent evaluation of all its education channels in 2012, including My New Business videos and e-learning tutorials. My New Business is one of the biggest free repositories of online learning content in the UK, so the results of these evaluation activities will be instructive for the e-learning industry as a whole. Wide-scale and free-to-access online learning initiatives are rare in our industry so it will be fascinating to see how the general public responds to this kind of resource. While playing the computer game LA Noire (where you take on the role of a detective investigating a series of crimes in 1940s Los Angeles), I was reminded of a fraud investigation simulation I produced several years ago. 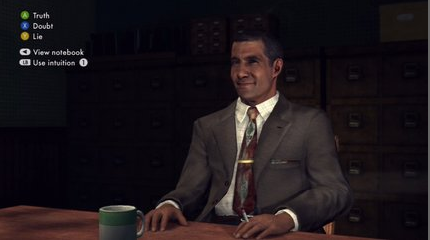 As part of your detective work in LA Noire you must interview ‘persons of interest’, ask them the right questions, and decide if they’re telling the truth. Still from LA Noire, produced by Rockstar Games. The fraud investigation sim I worked on featured a similar interactive approach. We filmed actors talking straight to camera to mimic the experience of being in a tense, face-to-face interview situation. Depending on your choice of questions, the characters under investigation would react accordingly (sometimes with explosive results!). Similarly to LA Noire, the goal was to challenge learners to ask the right questions and get to the truth. Evidence-based research conducted by academics such as Traci Sitzman is starting to validate what many training practitioners have known for years: game-based simulations can provide some of the most effective, motivational and memorable learning experiences the e-learning industry has to offer. My top 10 e-learning experiences. What are yours? As you’ll see, I’ve used e-learning in its very broadest sense in this list i.e. learning via electronic means. These are entirely personal choices (I’m sure someone else could put together a more ‘verifiable’ list based on awards won, measurable impact etc.) and on another day I’m sure I could come up with a completely different top 10. I’d be fascinated to see what other people’s best e-learning experiences have been, so please comment with your own favourites. So here they are in reverse order: my top 10. What are yours? On my first visit to Los Angeles I had the most profound sense of déjà vu while driving from the airport to my friends’ house in Culver City. Why? Because I’d done the drive before, in the simulated world of GTA: San Andreas. It’s no wonder that airlines, oil companies and the military invest so heavily in simulators when they provide such powerful and memorable learning experiences. Ok, forgive me for name-checking a project I worked on recently but I learned something in one of the tax modules which has resulted in lasting behavioural change for me, at least. What exactly? How to use the % button on a calculator! For years this had been a mystery to me. Why weren’t we shown how to use it at school? Although Captivate can be a mind-bendingly frustrating experience (Aaarrrggghhh, it’s crashed *again*! ), Adobe’s tutorials for this software (both in-built and on their website) are clear, easy to follow and got me producing professional looking Captivate demos and simulations for clients in no time at all. Need to brush up on some basic French or Spanish before going on holiday? Then visit the BBC’s fantastic Languages site which features a range of videos, audio clips and interactive materials to get you ready for your trip. In joint place because I couldn’t choose between them (and didn’t want to do a ‘top 11’)…Michael Allen is an instructional design hero of mine and the case studies and demos on his company’s site are a great source of inspiration for how corporate e-learning can be done with imagination and flair. IGN’s game walkthroughs are great, not only for helping me through some tricky levels in Zelda, COD and Half-Life 2 but by giving me a deeper insight into game mechanics which has informed my own approach to instructional design. This interactive documentary allows you to experience the Haiti earthquake as a survivor, journalist or aid worker. Compelling content, high quality videos and branching scenarios which make you an active participant in the story…this is a brilliant example of what e-learning at its very best can achieve. An obvious but undeniable choice. People whinge about the odd inaccuracy here and there (as well as the blatant mischief-making, which is part of the fun!) but as a first-stop reference tool, Wikipedia is unbeatable. Ah Mavis, where would I be without you? Ok, I’d probably be right here right now but jabbing at the keyboard 20wpm slower than I am currently. When I graduated and joined the massed ranks of the unemployed during the last recession, I was lucky to be living in an area which provided subsidised computer classes for the jobless, including access to the Mavis Beacon typing course. I’ve no idea what this software is like now but back in the 90s it featured a car racing game with a simple but brilliant motivational device: the faster you type correctly, the quicker the car travels; every time you hit a wrong key, a fly splats on your windscreen and the car slows down. I was hooked and have been happily touch-typing ever since. YouTube is the Godhead of online learning. After years of puzzling over the greatest guitar riff of the 1980s (‘This Charming Man’ by The Smiths, just in case you were wondering) I mastered it in an hour after watching a guy on YouTube do a tutorial in four easy steps. As a Photoshop dabbler, YouTube has been a tried and trusted friend for every aspect of this powerful but utterly counter-intuitive piece of software. A wealth of searchable, relevant content – generated by real enthusiasts – is the key. This is what the corporate world needs to take note of. The YouTube learning model has immense practical application in the workplace: we need to capture the skills, knowledge and experiences of our best people and share them online. And if your company’s internal network doesn’t have the bandwidth to deliver video, why not set up your own YouTube channel? Sadly, I fear many people’s favourite e-learning moment might well be…‘Switching It Off!’ That’s because too many e-learning courses are boring, over long and delivered via cumbersome Learning Management Systems. But, as hopefully this list goes to show, e-learning doesn’t always have to be like that.